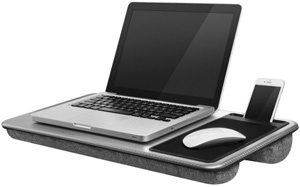 Q&A: Is it ok to hold my laptop on my lap while I'm using it? Q&A: Is it ok to hold my laptop on my lap while I’m using it? Question from Keenan D.: Hi Rick. I hope you can answer a question I have about using my computer. I have a 15.6″ Acer Aspire laptop and I usually rest it on my lap when I’m using it because it’s more convenient that way. My roommate is constantly harping on me to stop holding the laptop on my lap because (according to him) it can cause serious health problems. Is he right? Rick’s answer: Keenan, there are conflicting opinions about the possible health risks associated with resting a working laptop on your lap, and I really don’t feel qualified to offer a medical opinion about it to be honest. That being said, even if holding a laptop on one’s lap poses no real health risk, it’s still a bad idea. As I explained in this post, a running laptop needs to “breathe” in order for its internal components to stay cool. After all, heat build-up is one of the leading causes of premature component failure. When you rest a laptop on your lap, the air vents can become blocked, restricting the airflow into and through the machine. That leads to heat build-up inside the CPU and other critical components which could cause the laptop to fail prematurely. I can certainly understand your desire to rest your laptop on your lap while you’re using it, and you can safely do that IF you rest the laptop on a lapdesk or some other stiff, flat object to facilitate proper airflow into and out of the machine. Bottom line: Your roommate was right to caution you about the dangers of placing your laptop on your lap, but I believe the real danger is to the laptop, not you (as far as I know). I hope this helps Keenan. Good luck! Bonus tip #1: This post explains how to safely clean your computer or mobile device.